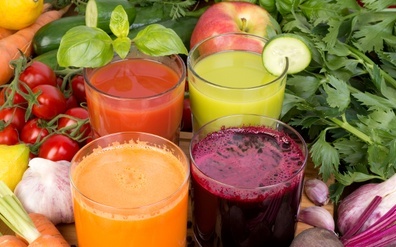 Super juices are made from ingredients that are especially nutrient rich and have strong anti-oxidant properties. 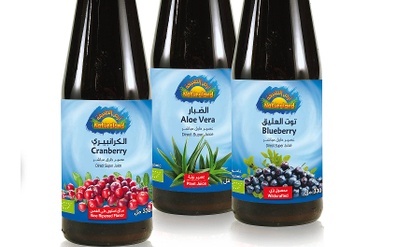 A few examples of these ingredients are: pomegranate, elderberry, blueberry, blackcurrant, Acerola, Aloe Vera, Aronia or cranberry. Each of these ingredients individually offers a variety of health benefits. The juice extracted can sometimes be acidic and for this reason they are often combined with sweeter juices such as apple juice in order to improve the taste. Alternatively the super juices can also be mixed with water. Each of these ingredients is often referred to as a superfood because of their rich nutritional value and health boosting benefits. Some of the fruits are relatively rare and are not commercially available worldwide. Therefore being able to enjoy the fruit as a juice is a bonus as you get to benefit from the nutritional goodness without having to travel half way around the world to find the fruit. Better health results from foods that are rich in nutrients and have strong anti-oxidative qualities. These super juices provide a convenient nutritional boost to ensure that you get the added vitamin and minerals you need to maintain good health even with a busy lifestyle. Every care is taking during processing to retain the highest nutritional value of the ingredients. The fruits are selected from orchards that use either organic or biodynamic farming methods to ensure that the fruits are free from artificial chemicals. The processing time is limited and the juice is bottled immediately after completing the cold pressing and flash pasteurisation process. Cranberries are rich in vitamin C and phytonutrients. These phytonutrients are believed to promote cardiovascular health as they contain anti-inflammatory and anti-oxidant properties. Cranberries are also associated with improving urinary health. This delicious berry contains a rich source of nutrition. The anthocyanins are phytonutrients found in blackcurrants that have strong immune boosting properties. Carotenoids in blackcurrants contain vitamin A and C and perform an anti-inflammatory and anti-oxidant function that helps to fight off disease. Blueberries are delicious, nutritious and very easy to juice. Their rich dark blue colour provides a clue that they contain powerful antioxidants and promote overall good health. Health benefits include eye health, blood sugar benefits, improved memory function, improved blood lipid profiles and immune support. Elderberries are rich in antioxidants and vitamins. 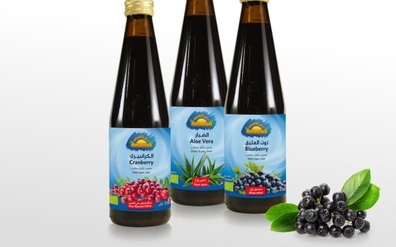 The bioflavonoids in elderberries have powerful disease fighting properties, help boost the immune system, and aid in the treatment of the common cold as well as other viral and bacterial infections. The phytonutrients in pomegranates are believed to house many of this fruit’s nutritional benefits. In some studies pomegranate juice has shown to have a positive impact on blood lipid profiles, improving cardiovascular health. The strong antioxidants in pomegranates help reduce oxidation in cells and are therefore favoured as an anti-aging treatment. Pomegranate is also used to boost kidney and liver function and the immune system. Acerola is small, bright yellow or orange berry also known as the Barbados cherry. Acerola is a wonderful source of vitamin C which helps boost the immune system. 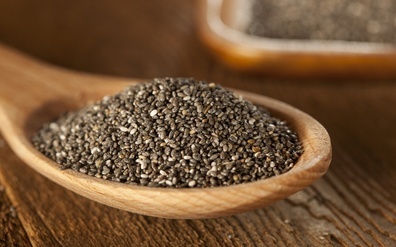 It also contains other important minerals such as magnesium, iron and calcium. Acerola is used to treat inflammation in the gut and improve overall digestive health. It is also and energy booster. Aronia berries are nutrient dense and have been found to be useful in treating a number of ailments ranging from cardio or digestive conditions to more chronic diseases such as cancer. Aronia berries are red or black in colour and a similar size to ripe blueberries. Aloe vera is plant rich in vitamin B1, B2, B3, B6, and B12, as well as vitamins A, C and E. It contains a number of essential minerals that include: Manganese, iron, sodium, copper, zinc, calcium, selenium, potassium, and magnesium. 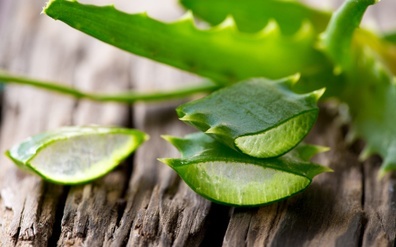 It is the anti-bacterial and microbial properties of aloe vera that offer some of the greatest health benefits. It has been used to reduce inflammation and boost the immune system. While blueberry and blackcurrant juice has a delicious sweet flavour, many of the other super juice ingredients can have a slightly sort of bitter flavour. For this reason, in order to make them more palatable the super juices can be combined with water or another type of fruit juice such as apple.In this way you can enjoy all the nutritional health benefits and a great taste. 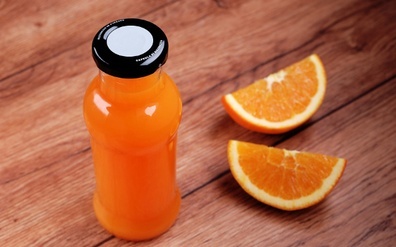 The fruit selection and processing of the juice has a key impact on the nutritional value that the juice contains and ensures you get to enjoy the highest quality juice. Cold pressing, flash pasteurisation and immediate bottling ensures that the nutritional value of the juice remains high through processing. The result is a range of super juices that can provide the best nutritional goodness from around the world in the convenience of your local supermarket.